I am very unhappy about this. CMI (NACM's business-to-business credit report) is falling out in a most determined fashion. Folks, look at this mess! You can get the reports here.. I don't know why so little attention is paid to this report, because it gives you a very important part of the picture. The trajectory for the combined index since last September: -1.8, +2.1, -1.1, -0.9, +0.3, -2.0, -1.9. Now, this latest fall is quite worrying, because it is telling us that the spring pickup is not destined to be very strong and will be isolated to consumer spending pickups. This looks a lot like the credit crunch is propagating itself through the business network. Manufacturing (disputes, beyond terms, cust deductions) for March: 48.6, 46.0, 48.7. Note also the ominous rise for C&I back in 2007 shown in the graph above. And speaking of 2007, we did not see contractions in the B2B amount of credit extended until Oct/Nov 2008. A blast from the past. On the brighter side, you will note that the trajectory downward was far, far steeper in 2008, and the unfavorable factors had been worsening for a long time, which is why the trajectory downward was so steep. So this is not the springloaded spiral into despair one had then. And it is not certain that the consumer will not carry this through, although consumer credit indicates a somewhat strapped consumer without tremendous carrying power. 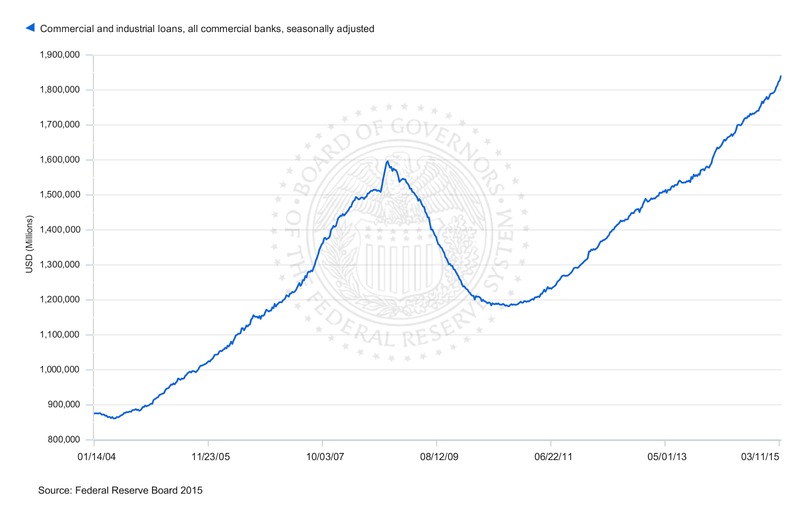 But in 2007/2008, you had a correlation with the collapse in consumer credit, when they realized they couldn't infinitely draw credit from their homes. That produced a tremendously strong correlation with a tremendously strong recession. This does explain why CPI is higher than it should be - companies are determined to keep prices high to maintain profit margins. It's not at all clear that we have the sustained correlation necessary for a real recession here, but it is time to get sober and watch carefully. The big fall in energy prices did provide some consumer boost, and given a bad winter, it was urgently needed. Freight is unclear. Rail has blisteringly high intermodal (partially related to the earlier labor action, and perhaps partially related to icing conditions that probably shifted some freight to rail). We'll have to wait a few months to see how that shakes out, but probably retail is overstocked, apparently at the wholesale level according to business inventories/sales ratios. However I have not attached too much importance to that because a lot of it is in the petroleum build. However, it's apparent that there is a business input pile-up at wholesalers in stuff like metals, computer equipment and so forth. So I guess we wait to see what happens, but don't count on inflation and interest rate increases in the summer. We probably have a tug of war going on between businesses trying to keep prices up and consumers still having cash flow issues, and the companies need to come off the pricing to get consumers to spend more. But large companies have a strong dollar profit problem, as overseas profits are comparatively worse when translated to the USD. Construction is holding up fine so far. We should begin to see weakness in jobs reports based on the latest round of activity reports. Consumer credit is rising, but student loans continue to account for a very large share of the accumulation. As a flow contributor, my reading of the university system is that on net, it must still contract, so that's not a terribly strong indicator. From first quarter 2014 to Jan 2015, total increase was 223 billion, and federal government was 99 billion. I began this year sure that my recession call was wrong, due to expanding consumer purchasing power based on lower fuel prices. But now I begin to think I was perhaps a bit overoptimistic - we could be looking at a delayed reaction rather than a real reprieve. I hope not. On the brighter side and on a completely different topic, the diabetes/metabolic syndrome research thing is going stunningly well. We now have three patients who have recovered more than 20 points of their ejection fraction. 45->67%, 25->47%, congestive heart failure to 35%. The last was a man who doc swore had no hope but a heart transplant, but he can walk for hours now. Also excellent and improving organ function. We are now trying to get to the children and reverse the early insulin resistance with a protocol that we hope will offer real hope for what is really almost an entirely genetic disease. The older adults have gained decades of life expectancy. PS: Accidentally when experimenting on myself I appear to have totally cured myself. After decades of neurological disease, which turns out to have been a completely genetic issue.